Welcome to the first Happi R&D Salary Survey. We polled a portion of our readers— research and development personnel involved in product formulation—to determine their attitudes toward their jobs, their level of education, their salaries and what their biggest concerns are at work. We believe this survey provides a quick snapshot of the household and personal products industry from the men and women in the trenches—those who provide the marketplace with key research that drives new technologies and delivers new products. Our survey was conducted online in March 2010, and all told more than 1000 people took part in the survey. A special thanks to all who participated— including the winner of our iPod Touch giveaway. We’re looking forward to including more of you in our 2011 R&D Salary Survey. 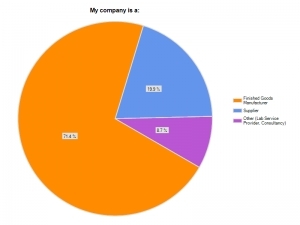 Our respondents came from manufacturers of personal care/beauty products, household products and industrial and institutional cleaning products (I&I) as well as the suppliers that provide them with raw materials they need to craft their wares. By category, 71.6% of the respondents came from finished goods manufacturers, with the remaining falling under the supplier category. Of those surveyed 76.5% worked in the personal care/beauty sector, 16.2% in household products and 7.3% in I&I. Respondents included R&D directors (12.8%), lab/technical/R&D managers (22.4%), senior chemists (16.8%), chemists/formulators (18.7%), technician/lab support (4.8%) and other (24.5%), which included titles such as regulatory affairs manager, quality control, etc. By gender, the group was rather evenly split— 48.2% of respondents were men and 51.8% women. We’d like to meet the 24 of you participated, but did not answer this question! The median age of our respondents was 42. The oldest respondent was 72 and the youngest was 20. The median years experience in the industry was 15. The majority of respondents (70.3%) came from the U.S./NAFTA region, 13.4% came from Asia-Pacific, 8.5% came from Europe, 2.5% from Latin America and 1.6% from Middle East/Africa. “Other” was the response of 3.7%. Just 4.4% of our respondents said they had been laid off in the past year. 10% of respondents said they had changed companies in the past year. In terms of raises, 52.6% said they received a raise for 2010 while 47.4% said they did not see a bump in their salaries. The vast majority of respondents—more than 90%—had not taken a cut in base salary in the past year. However, almost 16% said their company had stopped matching 401(k) contributions or cut other retirement-related benefits. Here is a look at how respondents felt about whether or not their compensation reflects their level of responsibility. 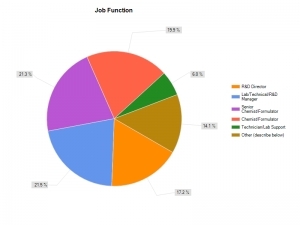 When asked what is the most frustrating aspect of your job, respondents answered varied, with several categories pulling in similar percentage. The leading response, by just a few points, was inadequate compensation (17.6%), a nod to these trying financial times. Those issues aside, when asked how likely you are to leave your current company in the next two years, 32.5% said that was “very unlikely” and just 14% said “very likely.” (Responses were based on a sliding scale of 1-5 with 1 being very unlikely and 5 being very likely). In terms of job security, when asked how secure your feel in your present position, the vast majority of you feel secure to very secure. (Responses were based on a sliding scale of 1-5 with 1 being very insecure and 5 being very secure). When asked what is the most frustrating aspect of your job, respondents answered varied, with several categories pulling in similar percentage. The leading response, by Nearly 61% of respondents felt that it was“very unlikely” that their company would be acquired in the next 12 months. Only 4% felt it was “very likely” that their company would be involved in a merger or acquisition. (Responses were based on a sliding scale of 1-5 with 1 being very unlikely and 5 being very likely). While the information above casts a wide net, here is a way to gauge your current compensation—and concerns— with that of your peers. In most instances we have included compensation levels for specific geographic regions as well as by gender, supplier vs. finished goods manufacturer and by industry (beauty/personal care vs. household products vs. I&I)—when survey data supported these responses.There are also results of leading job concerns/issues based on job function.